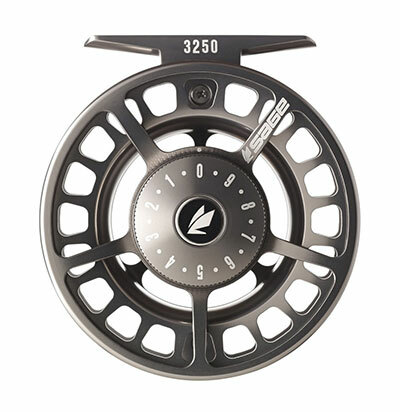 The Sage 3250 reel — slightly larger than the 3230 reel tested but in the same finish–is made for 5- and 6-weights. With such a hi-profile stable of fly rods consistently garnering attention, I hope you’ll forgive me for never really thinking of Sage as a reel manufacturer. And yet, over the last decade, Sage has gone on to design and build several acclaimed models that until now I never paid attention to. On a whim, I asked Sage to send me a 3230 reel. It’s the smallest of their newly released 3200 series, and it supports a #3 or #4 line. The 3200 series is the fully-machined relative of the 4200 series. A bit smaller in diameter than the 4200, but still a true large-arbor, it has the same concave spool surface as the 4200 for optimal line capacity and drag-assisting smoothness, and it’s a true lightweight—impressively so. Top-tier machining and assembly resulting in a reel that operates smoothly at all drag settings. The reduced weight balances well with newest generation of ultra-light rods. The drag knob is perfect: oversized, textured, fully centered and features 20 click-lock settings to accommodate every conceivable fishing situation. The drag itself is a fully sealed carbon system that is smooth even at the highest setting, which was hand-tested (25-pound monsters were scarce on testing days). In the past, I lost several fish by erroneously adjusting a reel’s drag too high while landing a fish, but the drag control on the 3200 series has a max limiter (one complete rotation, which comes to a hard stop) that comes in handy when an unexpectedly large fish clamps down on a fly. The reel sports a super-fine, brushed finish with a high polish. The matching aluminum, hourglass grip is a nice final touch. The 3230 comes in at 4.6 oz and the series covers line weights #3 to #8. All considered (price, design, performance, ultra-light weight, materials and build quality), this reel will easily find a spot on many of this year’s “best buy” lists. Special note: the brushed platinum/slightly reflective finish seen on the Sage website has little to do with the finish of the actual reel. What you should expect is a highly polished, clear-coated, and highly reflective surface. If you’re not fond of flashy gear, go with the black/platinum finish.